Surselva means “above the forest” in the Romansh language, and this sprawling district in predominately Romansh-speaking area of Graubunden canton is a delightful winter destination encompassing wooded countryside along the Anterior Rhine Valley (Vorderrhein) between Disentis and Reisenbach. 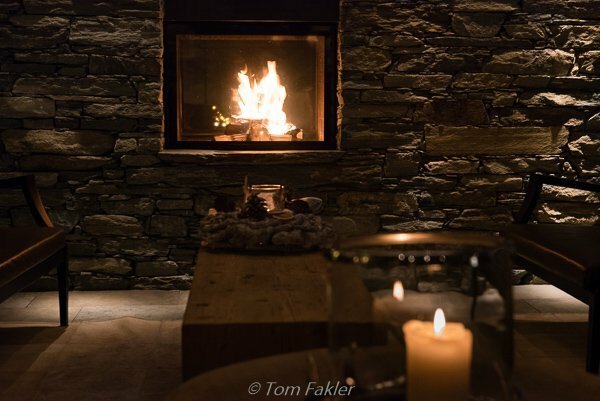 Last week, in the village of Brigels, Tom and I luxuriated Surselva’s refreshing mountain air, great food and some fine relaxation. “Our hotel is atmospheric, with village character” says Chris Faber, when asked what makes La Val Bergspa Hotel Brigels special. Contemplating the well-designed spa facility, and cozy touches throughout the hotel, I heartily agree!. With just 33 rooms spread over two spacious buildings, there is never a sense of over-crowding or a rushed pace. Candles burn on ledges and window sills, and a welcoming fire spreads cheer in both the reception space and smokers’ lounge. Myriad lovely touches conspired to set the tone for a relaxing stay, far from any sort of hustle or bustle. Two chalet-style buildings house La Val**** Bergspa Hotel Brigels, with all guest amenities easily accessible. Hotel La Val’s rooms are furnished in “alpine chic”, with knotty pine walls, planked flooring and other rustic touches. 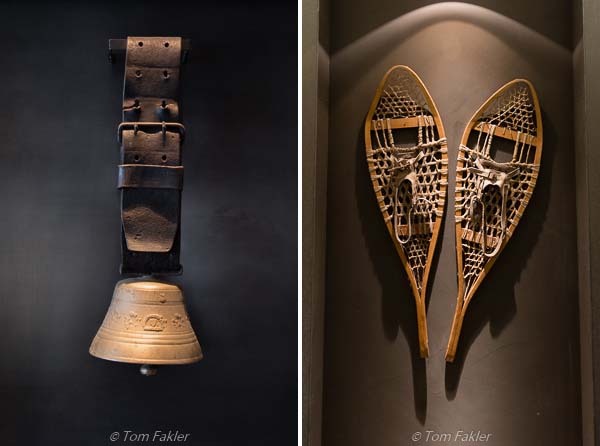 Antique cowbells, nostalgic winter sports “gear” adorn walls throughout La Val Bergspa Hotel in Brigels. 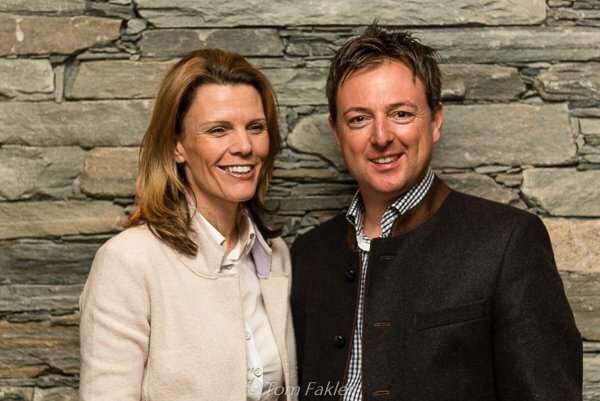 On-site managers of La Val**** Bergspa Hotel Brigels, Susan and Chris Faber attend to guests’ every need. Chris worked with architects and designers to make sure a first-rate infrastructure for the hotel, using locally sourced materials wherever possible. This is a land of laid-back outdoor enjoyment. In Brigels, there are chair lifts to alpine slopes and hiking trails, and long and swooping curls of cross-country runs through the valley. Trails marked for winter hiking and snowshoe outings lead out of the village and across wooded hillsides. 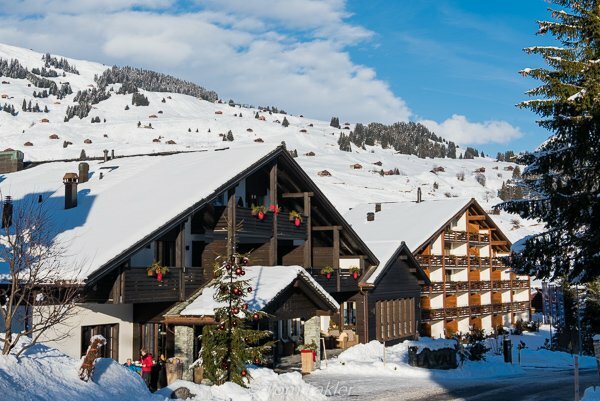 The ski region of Brigels-Waltensburg-Andiast offers myriad options for winter explorations, including 75 km of pistes for ski aficionados and 15 kms of cross-country tracks. Night skiing and snow tubing is on offer until the season ends in March. Back at La Val, time in the beautifully appointed spa is highly recommended. The hotel’s spa offers Finnish and herbal saunas, steam rooms and roster of spa services. Two visits in two days did not seem to be overkill, and I treated myself to a fine massage, as well as time in aromatic heat. The experience worked wonders, taking the chill off, and dissipating all that city angst. 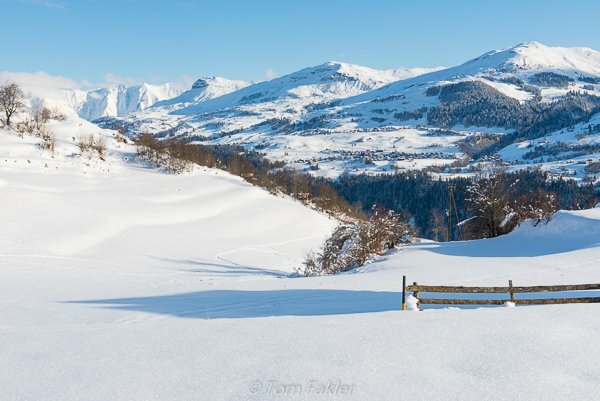 From a walking path just outside the village of Brigels, Graubunden, an expanse of pure white. 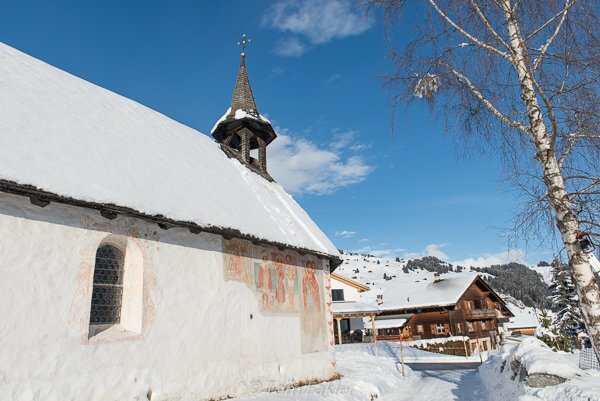 The Chapel of St. Jacob, just steps from Hotel La Val, was built in 1514. Italian artists added frescoes a century later. Breakfast at La Val is a generous and healthy buffet, featuring cheeses and meats from local producers, along with yogurts, fruit and cereals–not to mention country breads, crackers and a couple of sweet options. Juices, teas, hot chocolate, and importantly (for me), a top-notch espresso round out the morning meal. Chef Rudolf Möller has received 14 Gault Millau points for his innovative half-board menu in the hotel’s restaurant, Ustria Miracla. The menu has a “No butter, no frites” philosophy, instead offering a varied menu with plenty of healthy flavors served in delectable small portions. Manager Chris Faber and Chef Möller took the half-board menu up a notch when they initiated the popular Surselva Genuss Pur program, an annual series of dinners hosted by six participating chefs/restaurants in the region. We can highly recommend both versions of the Ustria Miracla menu! The hotel’s wine list is personally selected by Chris Fabor, who makes an annual tour, visiting vintners in Switzerland and abroad, and bringing home wines not readily available to most Swiss guests in their local shops. 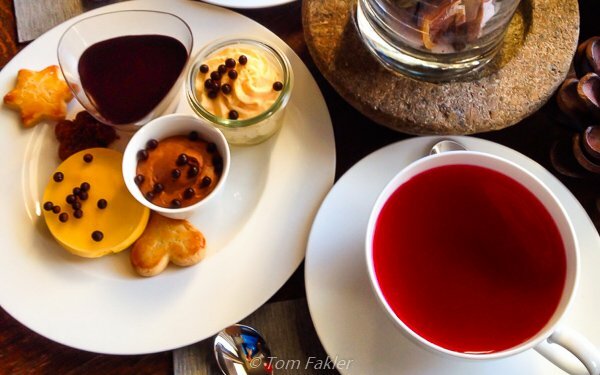 A stay at Hotel La Val comes with afternoon tea. It is a cozy affair, with an array of tasty bites and teas to choose from, and other beverages available from the bar. My favorite of this plate were two mousse cups, airy in texture and delicately flavored with mango and chocolate. The four-course half-board menu is available daily, and was the basis for the five-course Surselva Genuss Pur program offered annually by La Val. 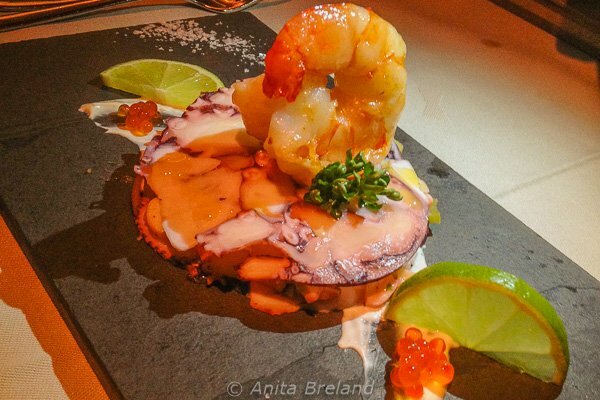 Here, octopus carpaccio over cubed, roasted potatoes, celery slivers and trout roe, topped with a single sautéed shrimp. In addition to the Gault-Millau-rated menu in Ustria Miracla for half-board guests, the hotel offers a fondue option and other regional specialties. 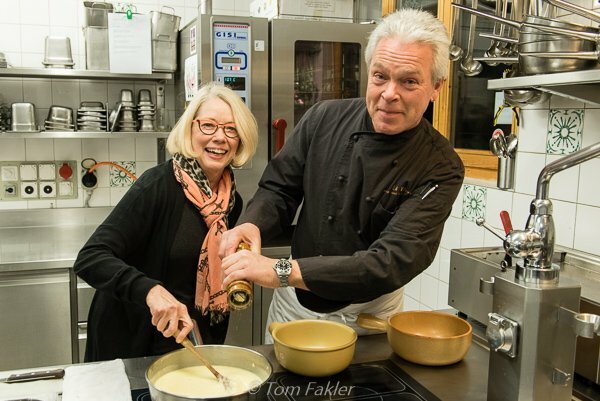 When we visited the kitchen, Chef Rudolf Möller allowed me to stir the fondue pot. Brigels is a quiet Surselva village, with traditional architecture, several fine restaurants, and shops offering regional foods and crafts. 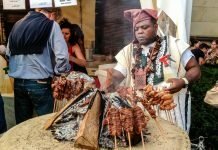 Residents are rightfully proud of locally made foods, such as capuns and malans, and a variety of dairy products and sausages. Some of the best products are available for purchase from the local dairy shop. 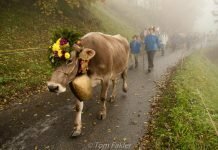 Brigels is a popular hiking destination in summer, and in September, cows are brought down from the Brigel Alps with an Alpine Parade and Festival. Brigels, Graubunden is perched on a south-facing mountainside above the Rhine valley. 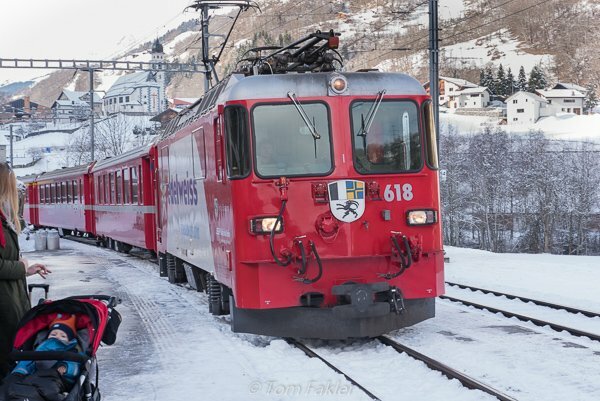 We traveled to Brigels on the superb Swiss Travel System, taking two trains and a bus up the mountain from the Tavanasa station. Our Rhaetian Railway connection in Chur was seamless, and the ride through the rock-strewn Rhine valley, a miniature Grand Canyon a la Swiss, very scenic. I can think of no better way to arrive in the Brigels-Waltensburg-Andiast holiday region! The RhaetischeBahn provides a scenic tour through the Swiss “grand canyon”, connecting the transport hub of Chur with Brigels and other destinations en route to the Alpine resorts of Disentis and Andermatt. Take the train and Post Bus! Train travel from all major Swiss cities is easy and well-connected, and the RhaetischeBahn provides a scenic ride. At Hotel La Val, go for half-board! Menu choices are innovative and healthy, and made with market-fresh ingredients. This is excellent value for meals that are beautifully prepared and delicious to the last bite. Book a spa treatment from the very capable staff. I enjoyed a traditional massage, and it was one of the best I’ve had anywhere! Sample village life, stopping in at local dairy shops for some Brigels food souvenirs, such as cheese, and frozen capuns and malans handmade in local home kitchens. The hotel offers packaged stays, rewarding stays of several days or including spa treatments. 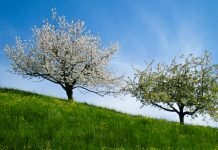 Check the hotel’s website for any offers that might apply at the time of your visit. We visited Graubunden as guests of Switzerland Tourism, and in Brigels, were hosted by La Val**** Bergspa Hotel Brigels. What a wonderful way to experience Graubunden! Anita, Switzerland is such a picture-perfect country. You’ve done it justice. I’m not familiar with this canton, so, clearly, another trip is required. 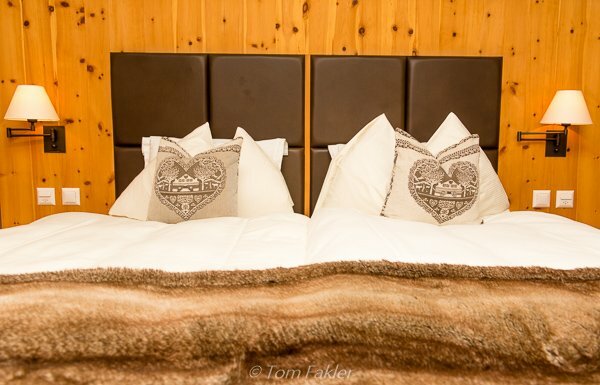 Hotel La Val’s alpine rooms look sooo comfy! Thank you, Ursula! Graubunden is a hidden gem, but not all that far from Zurich (and the international airport there). Definitely worth a trip! 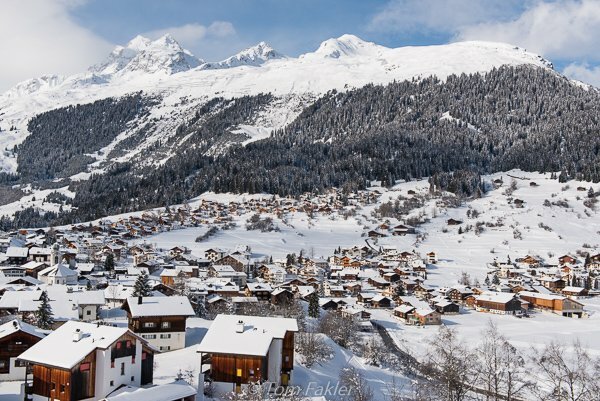 Although i’ve had enough snow here in Boston, your trip to Graubunden looks like a winter wonderland. I love the decor in the hotel, especially the bed with those charming heart pillows. And the food is so artfully presented. I love a spot that takes pride in all the little details. The Swiss are very good at details, let me tell you! La Val is special, thanks to this. Thanks, Carole! Both tea and fondue are great, but the treats for tea are really quite special. I’m ready to return for more.